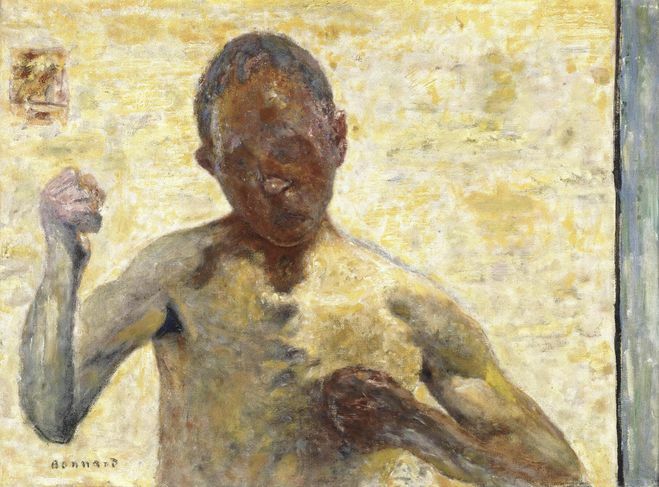 In this unusual self-portrait Bonnard slips into the role of a boxer practicing hooks and jabs in front of a mirror. We see him from his own point of view, looking at his reflection. The picture was done at a time when Bonnard had to face criticism due to his approach, which diverged from current styles such as Surrealism and abstraction. In Le Boxeur, as in other of his melancholy-seeming self-portraits, one senses the internal monologue the artist must have held with himself and his art, probing and self-critical. Like Matisse, he used colour and decoration determined the essential qualities of his art. Bonnard admired not only Japanese prints and screens but also Persian and Indian miniatures, capturing something of their iridescent multiplicity in this self-portrait with its brilliant orchestration of near and far views and its vibrant notes of Indian yellow, ultramarine, emerald green, creamy white and deep, reddish purple. 1- Terrasse called this ‘an internal examination of self’ which showed an artist who ‘lived at a remove from the world, sacrificing all to the passion for art’ see Antoine Terrasse, ‘Bonnard: The Colour of Daily Life’, trans. Laurel Hirsch, Thames and Hudson, London 2000, p.108.